Radius Steel, the U.S. based steel fabricator, has been contracted to build air ride suspensions for the commercial trucking industry. Lift axles are widely used on dump trucks, refuse trucks, cement mixers, fuel trucks, road tractors, and many others, to increase hauling capacity. Radius Steel Fabrication is recognized as a global leader in supplying industries with the highest quality fabricated equipment. Radius Steel Fabrication, a division of SOO Tractor, a global leader in supplying industries with the highest quality fabricated steel equipment, announced today that it has entered into an agreement with Silent Drive, Inc. to manufacture lift axle components. Silent Drive is a leading worldwide provider of lift axles, portable lifts, and portable surveillance platforms. Headquartered in Orange City, Iowa, Silent Drive provides a wide range of air ride suspensions to help commercial haulers increase their revenue. Lift axles increase the outer bridge of a truck, adding up to 10,000 pounds of additional payload capacity per trip. Silent Drive CEO, Mark DeJong, attests, “Radius Steel is a key resource and partner for the manufacturing industry. 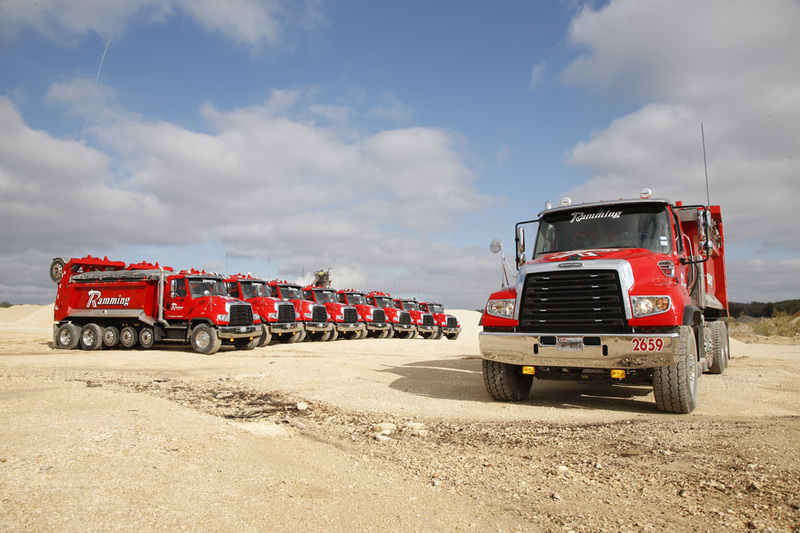 They truly understand quality, precision, and the importance of a quick turn-around.” Silent Drive’s air suspension systems are increasingly being used by commercial trucks operating in the exploration and production segments of the oil and gas industry, refuse, construction, and in commercial hauling. Silent Drive’s lift axles are a superior fleet investment decision. They are designed and manufactured to not only outlast the truck replacement, but can also be moved from vehicle to vehicle. The new lighter and stronger design saves trucking companies’ fuel costs. This fact, together with the ability for increased payload capacity but with less capital needed to re-equip vehicles, the customer can achieve a substantially higher profit margin. Radius Steel is ISO certified and has the experience and capability to manufacture world-class products. Radius Steel is a turn-key manufacturer that provides complete solutions. They provide steel fabrication, advanced welding, blast and paint technologies, complete assembly and shipping of their clients’ products – all with a 1 to 4 day turnaround on established product lines. With two strategically located factories in the upper Midwest, the company is well positioned to ship to any location. “Success happens when quality driven companies partner together,” says Ida Covi, CEO of Radius Steel. Radius Steel Fabrication - SOO Tractor is an established and leading steel fabrication company in the United States producing exceptional products for a range of classic brands, amongst them, Massey Ferguson, AGCO, Hesston, Challenger, Wil-Rich, SmithCo / Side-Dump, and Silent Drive. Radius Steel Fabrication/SOO Tractor was established in 1941 to meet the needs of the agricultural machinery industry and has become renowned for the quality of its customized steel fabrication; setting new standards of environmental protection and exceeding the requirements of its clients and partners. We are proud of our ISO certification and in the satisfaction of our customers... we have a warranty rate of 6/10th of 1%. Radius Steel Fabrication - SOO Tractor's tradition of excellence provides customized fabrication integrated with electronics and cutting-edge technology to an expanding range of industries amongst them, Telecommunications, Military/Defense, Heavy Equipment/Construction, Refuse, and Oil and Gas.